So, you've been wanting to start your own blog, but you're completely clueless how to make one and most tutorials you find are full of jargons that you don't even understand. Been there, done that! Trust me, it was pretty frustrating. I remember how scared I was to start my own site.. it seemed like a very daunting task. All those blogging mumbo jumbo made my head spin! Luckily, I had a friend to convince me to go for it. She helped me with the setup while I did the design and some tweaking. I was overwhelmed by the intimidating details but I wanted to learn, so I didn't give up until I got myself familiarized. Now I'm here, teaching you how to make your own blog. Quite amazing, right? In this post, I'll walk you through the whole process and I'll include some tips on how to promote your blog as well. So if you’re actually serious about setting up your own blog, not just a Tumblr or a Blogspot-hosted one, read on. Don't worry, it's not as hard as think. In fact, you can build your own blog in just few minutes. It's just I have to explain and give you tips to make sure you setup your website properly. Step #3: Install a theme (10-15 mins) - you're actually done at this point! PS: If you need the shorter version of this article, click here. You need to get a domain that is short and easy to remember and a reliable web host to keep your blog up and running. Your domain name will be your site's URL. For example, my domain is twelveskip.com. Your web hosting account (BlueHost) will provide you a space and/or a secure place to store your website files (layout, blogging software, etc.) and so to make your blog accessible via the internet. Go to Bluehost.com (click here for a discount + a free domain name) and select your plan. You can start with the starter one. You can always upgrade later! Enter your desired domain name, then click the “Next” button. If you already have a domain, enter your domain name instead on the "I Have a Domain Name" part. Now fill up the form and select a package. I recommend you to get their Domain Whois Privacy for $9.95 per year to prevent your personal information from being displayed to the public. Now move to the next step: setting up your website (see step #2). Wordpress will be your blogging platform - a content management system (CMS) where you're able to control your blog's content such as adding a new post, editing existing pages, editing your layout, etc. Once you get your username and password, login to your Bluehost cPanel account. 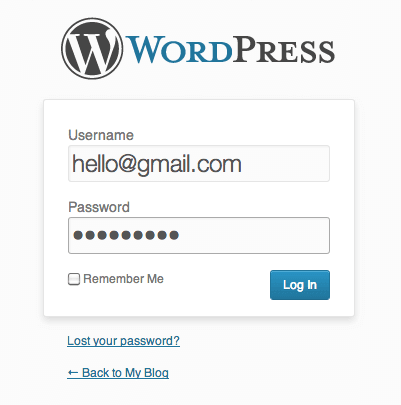 Click "Hosting” then and click on the "Wordpress" logo within the Website Builders area. Read the terms and conditions then check "I have read the terms and conditions of the GPLv2" then click "Install Now" button. Now wait for the progress to finish, which should not take more than 5 minutes. Once done, click on the "View Processes link then click on the "View Credentials" link, which are located at the very top of your screen. And you're done! You have your blog setup now. Easy, isn't it? To access your Wordpress panel, click the “Admin URL” provided by BlueHost. Enter your username and password then login. You should now see your Wordpress dashboard! Play around to familiarize yourself. Do some tutorial research to get the hang of it. You can use a free premade theme, buy one, hire a web designer OR hire me :) If you decide to install your own, click here for a tutorial on how to install your own. BUT where do I get themes?! To use a free theme: Login to Wordpress, go to Appearance > Themes > Install Themes and start your search. Or you can simply go to wordpress.org/themes. To buy a professionally-made theme: My favorite is Themeforest.net (price ranges from $30-$60). You may also buy from Elegant Themes / Themefuse or Template Monster. For more premium WordPress themes, check out our Premium WordPress themes section. You've officially built your own blog. YAY! That was easy, right? Now you can either move into the next steps below to learn further or explore and play around your blog. Congratulations! You’ve actually set up your very own blog. You have your blog, now what? you should know how to create a valuable blog post. You can’t just go writing and posting just anything under the sun. And even if you do focus on your chosen niche, it’s still not enough to go ahead stuffing your site with irrelevant entries. Develop a writing style and voice that you can call your own. This means that you ought to write as if you’re talking to a friend. The words have to come out naturally. Make sure you are providing something new and useful to your target readers. Don’t just lift something from the web and rehash it. Why don’t you inject your own experiences or perhaps come up with a new twist to an old story? Use an eye-catching title that will make people want to click on a link and read the entire article. Accompany your article with a relevant image or video. Add a call to action message at the bottom so that your post can actually deliver the purpose which you had planned it for. Master these simple tips and you’re bound to keep producing valuable blog posts and thus gaining loyal followers and readers in the process. You have your blog set and you provide a very good content. The next thing you want to do is to let people know about your blog. Of course, the more people who read your blog, the more motivated you will want to post, right? Add social sharing buttons to your blog posts. I am currently using SumoMe plugin for social sharing + image sharing. Use social media. Ask your friends to like your page and share new and useful posts on your social media accounts. The most popular ones are: Facebook page, Twitter, Pinterest, Youtube. Join forums that are related to your blog's niche and show off your expertise by helping others. Be friendly and comment on other blogs! Search for relevant blogs, read or skim their post and add a valuable comment. Learn how to get visitors from the search engines like Google search, Yahoo, Bing, etc. In the blogosphere, we call this strategy "SEO" (Search Engine Optimization) - this means you have to optimize your site to make it search friendly. You will do something to make your site visible to the search engines so people can easily find your site on search. Here's a separate article that can help you generate visitors from the search engines click here. For more tips on getting website visitors, read this. To track how many people that visits your site, use Google Analytics. Of course, you will also want to make money to cover your expenses and to keep you motivated as well. Read this article to learn how to make money through blogging. PS: Whether you intend to blog for the sake of sharing your thoughts, ideas, feelings, and opinions to the world or perhaps you want to use it for the promotion of your business or organization, blogging will certainly help you establish and strengthen your online presence. You can make people from around the world sit up and take notice of you. Please note that I am currently affiliated with some of the provided links in this post but I am recommending them because I trust and I have used them. I can be affiliated with other companies anyway, but I choose to do business with the ones I actually trust.